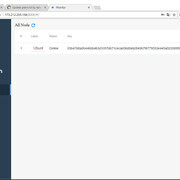 Ive never used linux before, but want to reformat my laptop and use it as a node once skywire is up and running until the parts list for skyminer v2 is out. Is there any specific version of linux i should install? Also, if i want to dual boot into windows is there a specific order i have to install it in? (01-09-2018, 06:43 AM)JayBee Wrote: Ive never used linux before, but want to reformat my laptop and use it as a node once skywire is up and running until the parts list for skyminer v2 is out. Is there any specific version of linux i should install? Also, if i want to dual boot into windows is there a specific order i have to install it in? I entered the browser address in this format: 192.168.1.14/8000/#/ and everything is working now. Thanks to Mitja Gomboc and Skyguy for the tutorials! i got the node up and running and i can see it at 127.0.0.1:8000/#/ but are we also supposed to be able to connect to it with our public ip & port 6000? (01-04-2018, 06:13 PM)trader95 Wrote: Does running this node generate skycoins? Or does it only help the network with something? Can you share anything regarding the timeline (just generally, do I need to think in terms of days/weeks/months)? Great write up, thanks! I had trouble on the linux wallet section - I could not alter the IP to change it to my own IP any idea what I was doing wrong? Also, how will we link our nodes to our wallet to collect coin rewards once main net is running? Last thing - I was doing this via ssh on terminal so couldnt view in a browser, would that matter? I'm on the boat too, now. I'm very exited. This post was very helpfull for me, thank you a lot!!! is it normal? It shows "started", not "send" and "recv"
Current time: 04-20-2019, 12:53 AM Powered By MyBB, © 2002-2019 MyBB Group.